Sometimes I get an email which reminds me of forgotten photographs never shared. I don’t mean ancient black and white ones hidden in boxes, but digital photos I’ve taken and for one reason or another never put online. Here’s a few of the old ‘Fever Hospital’ on Huntington Road, near Yearsley Bridge. The photos were taken in November 2004. Back in 2004 I just popped along here and took a few pictures, and then forgot about the place. As did most of us, apparently. One letter in the local paper, on 11 September 2008, marked its demolition. 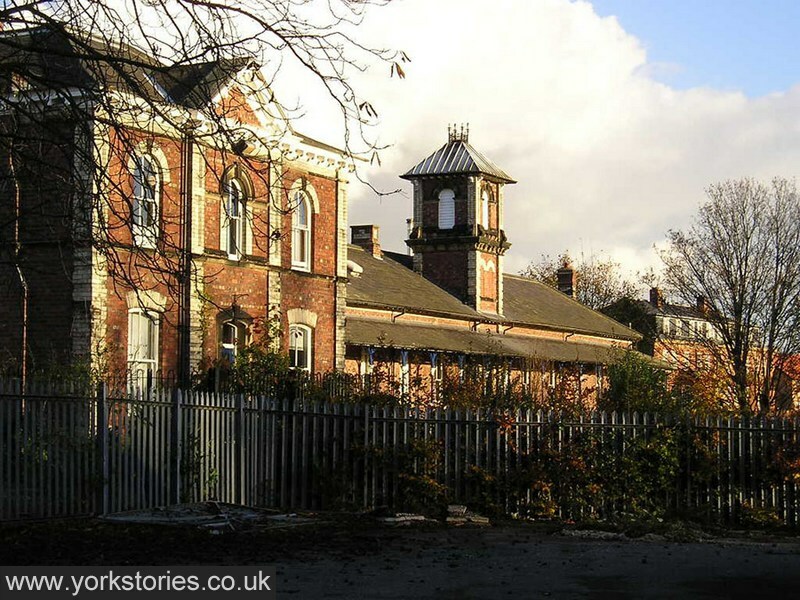 Perhaps the associations with illness meant few people were sad to see these buildings demolished. In any case, it appears that they’re gone. I can’t find many photos online, so these belong here in this online place of mine. Better late than never. Someone somewhere will be interested sometime. 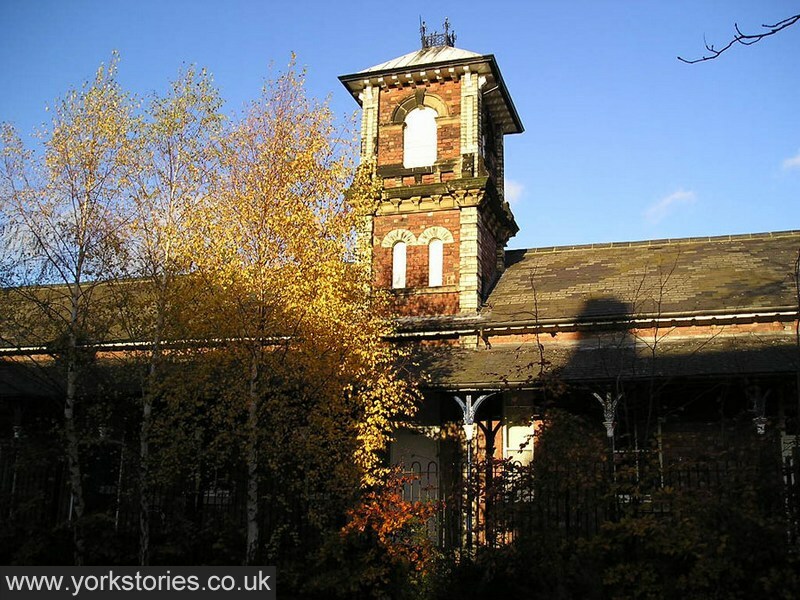 The earliest hospital buildings were constructed in 1879-81. They featured cast-iron verandas, where it seems the patients would sit taking in the fresh air. In the early years the patients were mainly those suffering from scarlet fever, a few had smallpox. 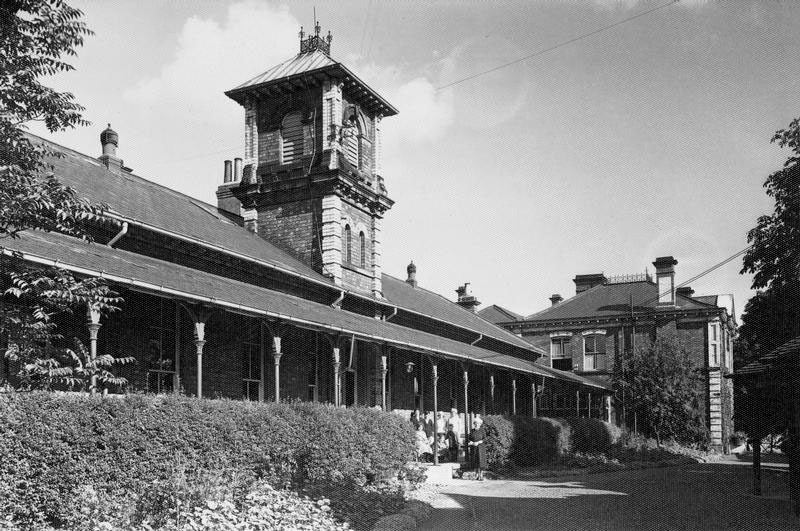 The hospital also housed patients with typhoid and diphtheria. It was enlarged over time and by the 1930s and 1940s patients with many other infectious diseases were treated here. It became part of the NHS in 1948 and was renamed Yearsley Bridge Hospital. Yearsley Bridge Hospital closed in 1976 when the city’s new District Hospital opened on Wigginton Road. The buildings were adapted for other uses, and known as the Huntington Road Day Centre. The online archive has many other photos particularly of the open wards. Try this link or go to the York Images collection and search for Yearsley Bridge Fever Hospital. It would be nice to hear from anyone who remembers the buildings in use. 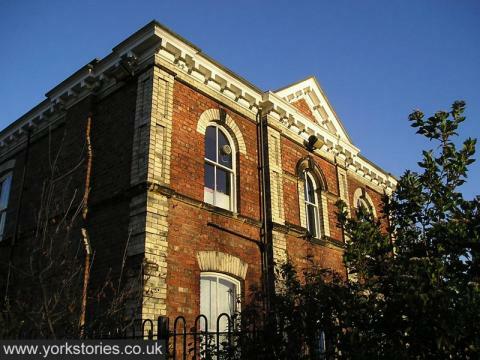 The planning application documents for the redevelopment of the site include a bat survey report from 2007 which includes photos of the building, and may be of interest to anyone researching its history. 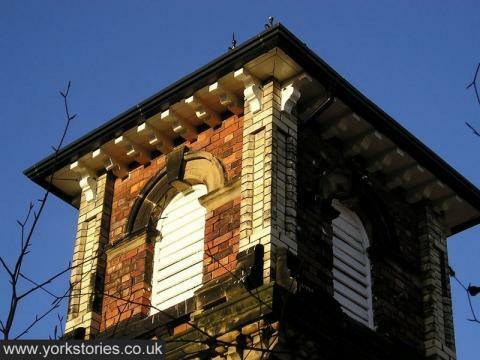 By Lisa @YorkStories • 5 August 2012 Buildings To link to this page's proper location please use the > permalink. I spent 6 weeks in the fever hospital in 1961 suffering from scarlet fever and suspected rheumatic fever. I was 11 years old and the only other patient in the huge ward I was in was another girl at the far end. My parents had to walk from Heworth to visit me and could only stay 30 minutes. My 2 brothers were not allowed in and I lay on the floor and talked to them through the ventilation grills. I seemed to be there a very long time it was so quiet and lonely, no TVs or radios and no staff who had time to chat or play. Near the end of my stay a large group of children patients arrived from a hospital in Hull(I think), moved to York to avoid a polio outbreak. When I got home after 6 long weeks my house seemed very small and cramped. The Fever Hospital as we called it took in Scarlet fever cases. it was not a pleasant building. My son had this and was taken in, we couldnt go in and see him, just look at him from an outside window. It was a long 3 weeks and made quite a difference when small children could hardly remember their parents when they finally returned home. Scarlet fever was an unpleasant illness for a child and my son was traumatised when he came home and did not know me for some days. My dad suffered a stroke in 1975, and Yearsley Bridge was where they parked him when it became clear he wasn’t going to survive. As a teenager, it wasn’t clear to me what was happening. I only knew that my dad had lost nearly all memory of everything that had happened since he was around 14 and had no idea who I was on the last day I saw him alive. Nevertheless I said, “see you tomorrow, Dad,” as I did each evening. But I never did. Thirty years later when my mother fell victim to a stroke, we were able to sit with her in York Hospital day and night, and say “goodbye” properly – no such consideration extended to families in the 1970s! I spent 2weeks in the hospital in 1973 when I was 11 with dysentery. I was in an isolation room and my mum was only allowed to visit. I remember been really lonely but the nurses were kind. During my second week a young baby was admitted in the next room which had a curtain drawn across the window. I think the baby had impetigo all over him???. When leaving a team came and sprayed the room to make it sterile. I really appreciate so much the memories contributed above. If I had included these photos back in 2004, when this website had no comments facility, it would have just been me writing about the buildings. As it is your contributions make a history of this place, where before there was nothing online I could find. I know it’s hard writing about things so personal. Thank you to everyone who has contributed. Comments and memories are always welcome, from anyone who remembers this place. I was in Yearsley Bridge Hospital for 2 weeks with scarlet fever in 1953. I was eight. Parents weren’t allowed into the ward, but could wave to their children through the windows. Sadly, my parents, who lived on the other side side of York, weren’t aware of this, so they never came to see me. I found this very distressing. I knew they hadn’t forgotten me, though, because they did send me big food parcels, with chocolates (my Mum worked at Terry’s chocolate factory!) and cakes. The whole ward was very excited whenever a parcel arrived for me, and we’d share out the treats and have cake at teatime. Once the fever had gone and I started to feel better, I made friends with other children on the ward and we had a lot of fun together. Although I was glad to go back home, I really missed the friends I’d made in hospital. I was in the fever hospital aged 5 in 1957,I had scarlet fever,and remember going to hospital wrapped in a bright red blanket and being carried into a waiting ambulance. Iwas the youngest child of 6, and was put on a ward with an open fire with a guard round it, I rember being strapped into bed and having nightmaresI also remember my mum having to wave to me through the window,after she had taken 2 buses to reach the hospital. I used to enjoy a ride on the rocking horse that we passed on the way back to the ward after being bathed. I was in there when I was about nine years old along with a lot of kids from south bank all with scarlet fever. that would be 1968 I think. I remember a lovely old nurse called nurse brown who used to take us out round the garden and the gardener showed us how to blow a birds egg. when we were allowed home we had to have a bath whilst they fumigated the room and after my bath I ran back in the room to get my teddy. the staff had emptied the room and had my teddy fumigated but I didn’t understand and they made me have another bath before I went home lol. I have recently moved to York and discovered that my house is very near to what was the Fever Hospital. I’d be very interested in hearing peoples experiences of being in the hospital itself, working there or living nearby. In 1951 l spent 3 months in the Fever Hospital, l was completely paralized as a result of polio. I was 7 years old. All l remember was not seeing my family for the first month, after that they were allowed to stand on a garden seat and look through the window. I believe there were only 4 other “Polio’s” there at that time. Finally was able to go home for Christmas, thankfully walking. Now live 6,000 miles away. Lovely to see the photo’s, though not a pleasant time to remember. ” Lindsey”requested replies from neighbours of the Fever Hospital.For 14 years from 1938,I grew up inNo 67 Fossway,adjacent to the field containing the Hospital Bungalow patient accommodation. My bedroom over looked these buildings,and many of these patients must have looked across the field at our house,longing for their incarceration to be ended,while I looked across at them feeling sorry for there plight.My future wife at 12 years old was one of these(unknown to me) suffering ,from dreaded Scarlet Fever,which attacked her hearing leaving her,aurally handicapped. I remember on the out break of WW2 ,a gang of men with shovels and a bulldozer,descended on the field between us, and excavated a long deep hole,with the intention of creating air raid shelters.The project became waterlogged and abandoned,leaving us a great play area and personal pond to get wet in. The shelter was eventually built opposite St Wulstans church,a long single brick erection with a 18” thick concrete roof dropped on top,on the road verge opposite No 63 Fossway,a veritable death trap if a bomb blast blew in the brick and the roof came down! Not Happy days,but very character forming!! Wow, what a great memory you have. The field must be where our house now is then. Was Yearsley House an original part of the hospital too? It has been really interesting reading so many personal and vivid memories of the hospital, and I’m glad this page has been able to gather together your stories, thank you. As I now have permission to include images from the city archives collection I’ll add in above the older photo of the hospital I’ve mentioned, as I see the link doesn’t work since they updated their site. I have so much enjoyed reading all the comments on here! I was one of the schoolchildren (Scarcroft school) who became I’ll with scarlet fever. I had just started school at 4 yrs old then became I’ll one day. My mum sent for the doctor ( they came straight away in 1960 ha ha) and he diagnosed scarlet fever & he went to call for an ambulance ( no mobiles then!). While he was gone, my grandad brought me a miniature jointed teddy & he sat on the bed & held my hand( this was against all protocol as it was very contagious !). This meant a lot to me as my grandad was quite stern, I knew I was his favourite and it gave me courage. I was most upset as the doctor told my mother to burn all of my clothes and toys :( I had just been treated to a new green gaberdine rubber raincoat with a red check lining ( I can still smell the newness & see the lovely green colour now after all the years). The hospital was huge and had a rocking horse in the centre of the ward, it was a rite of passage that as you recovered health, you got to plait the horses tail & have a ride on it. I remember a young jolly cleaner who used to tickle us with a feather duster & make us laugh, I looked forward to her daily visits so much! I eventually was sent home by ambulance & remember the driver hoisting a sack full of toys & my clothes out of the ambulance! I felt like a stranger & hadn’t hugged my mum for 6 weeks! I had an older brother, yet he didn’t get scarlet fever. The girl in the bed next to me ended up being my best friend when I recovered & we moved house as she surprisingly lived in the same street! So May memories of the fever hospital! I was 4and a half and had just started school in 1951 when I developed a rash and became quite poorly. My grandma recognised it and sent for the doctor who diagnosed scarlet fever and immediately called for an ambulance. I was taken screaming, wrapped in a pink blanket to the fever hospital with grandma weeping at the window. My 2 older sisters were quarantined for 2 weeks and I stayed in the hospital for 6 weeks never seeing my family for the whole time. Apparently they looked through the window. I remember being very poorly and upset. The nurses were lovely but couldn’t console me. After 6 weeks when the nurse told me my daddy was coming to take me home I burst in to tears as I didn’t believe her. I was traumatised for a long time and wouldn’t be left alone. I was left with a heart murmur and my parents were told to be careful as I wouldn’t be able to to strenuous exercise. Fortunately I was not wrapped in cotton wool and allowed to live a very active life. Don’t know the year, but I also spent time in the fever hospital with Scarlett fever. I remember being in a glass enclosed room. There was a girl in the next room in an oxygen tent. My family kept in touch with one of the nurses after I left the hospital,I think they knew her before I was admitted. I knew her as aunty Nora, I remember her peeling grapes for me. My father went off to the war when I was four, I was so sad especially as I wet the bed and was horrified to hear we were moving in with my aunt. I was an only child. Three months later I caught Scarlet Fever and was sent to an isolation hospital. I was the only child in ward of adults, I was kept in a crib, smacked if I wet myself (the nurses were too busy to come when I needed to go) and daylight bombing was going on, and the nurses were overworked and frightened..The blackout curtains were closed all the time, so the room was dark. .I am not sure how long I was there, several weeks at least, and my mother said when I came back that I wouldn’t look at her for several days when she came to get me (she hadn’t been allowed to visit me) and that I never wet the bed again after that!!!! I thought I would take a trip down memory lane to see if there was anything that might remain on the Fever Hospital. My younger sister and I spent almost 6 months each in the hospital in 1949. I was 5 and she was 2. We had both developed typhoid fever from our grandmother who happened to be a carrier of Salmonella ( she was an asymptomatic carrier) Later I found that she had not been told about the fact that she had infected us. One of those things that remained remained a secret. Interestingly she lived until the ripe old age of 93 years. She was an absolute stalwart and looked after me well when I was a medical student in Edinburgh. Although such a set of circumstances ( re infectivity ) could not be hidden these days- I am very glad that she was not told of what had happened. My abiding memory is of my younger sister and I being the only patients in a very large ward. The only people who visited us were my parents and my uncle and Aunt. I remember being incredibly lonely and was not even allowed to be close to my sister. Perhaps this is why my sister and get along so well now. Fortunately the memory of all of this is vary vague and to be honest this is the worst thing that has ever happened to me. Glad that it happened so early in my life. Thanks for the opportunity to be able to reflect on this experience. It’s very moving to read these comments, so many have included the word ‘lonely’, as you have, Alastair. Thank you for adding your memories to this page. I was evacuated to Scarborough in early September 1939 , I became ill with diphtheria around December I think it was and was admitted to the fever hospital. I was very ill and had to be nursed flat for some considerable time.I was still a patient at Easter. My parents who lived in Middlesbrough came to visit but were only allowed to see me through the tall external Windows. They brought me a beatiful chocolate hen in a box with wood shavings for bedding,an uncle had sent me a multi sided threepenny piece and had hidden it under the chick. After the choc hen had been taken away and distributed amongst the remaining children a nurse came along and disposed of my precious box along with my threepenny piece and threw it in the huge heating stove which was situated in the middle of the large ward, I wept for days. Eventually I finally got my three negative throat swabs and beat a hasty retreat.I had another ghastly experience during my incarceration but will keep it for another day unless of course you would like to read about it. I shall be 88yrs in three months time .regards, ‘ve.